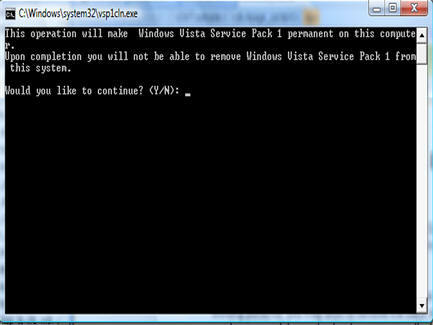 During the install of Windows Vista Service Pack 1 (SP1) windows backs up important system files to enable you to uninstall SP1 should you desire at a later date. If, a few weeks or months, after installing Service Pack 1 your system is working perfectly, you may wish to remove the back up files. This will need some careful consideration because, once the back up files have been removed, you will be unable to uninstall Windows Vista Service Pack 1. 3/ The command.exe command will be displayed at the top of the search box and will be highlighted. Click OK to launch the command prompt. 5/ In the command window type: vsp1cln.exe and press Enter. 6/ When the User Account Control (UAC) box appears, Click the Continue button. 7/ The command prompt window will now display the following (See Fig: 1). 8/ Type: Y at the flashing cursor point to indicate that you wish to continue. 9/ The Windows Service Pack back up files will now be permanently removed.